One interesting thing about being a Moto Guzzi California motorcycle owner is the reaction you get when you tell people what kind of motorcycle you ride. 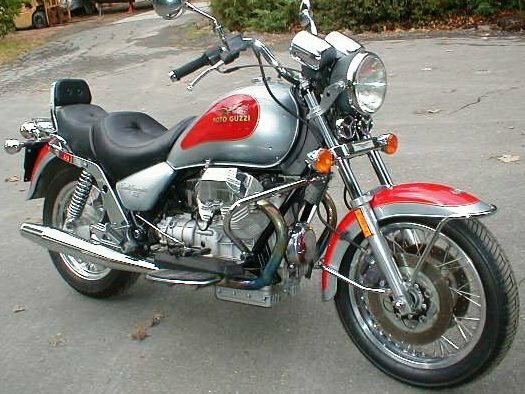 Of course, there are people that still have never heard of Moto Guzzi, especially in the US, but I’m talking about the ones that have. The reaction is usually interesting and the stories are usually similar. It’s often about the high number of miles a Guzzi has on it. My first story here is about a motorcycle dealer (not a Guzzi dealer). I have a friend that is looking at new motorcycles. There is a motorcycle dealer near where we work, so at lunch time, we went over there to take a look at what they’ve got in the showroom. This is a fairly large and successful dealership that sells Honda, Suzuki, Kawasaki and KTM motorcycles. Sales folks at motorcycle dealers always seem to ask what you ride. Two were helping us, and when I answered that I ride a Moto Guzzi California, one never heard of the brand, and the other had. The one that had proceeded to explain to the other, with a lot of enthusiasm, how he knows two people that have owned Moto Guzzis for many years and how amazed he was that one of their Guzzis has over 200,000 miles on it and the other is approaching 300,000 miles. He went on about how amazingly durable Moto Guzzi engines are and that he has never seen or heard of anything quite like it. This is a non-Guzzi dealer sales person spreading the love, which I think is just awesome. My second story is about a guy I met that was working at a BBQ joint one day where I was with my son on my California Vintage for lunch. By the way, this BBQ place is just about a mile from the dealer that I mentioned above. So, we ate our lunch and as I was paying the bill, one of the guys that worked there came over and asked me if that was my Guzzi in the lot. As it turns out, he also rides a Guzzi California, an older one, with over 100,000 miles on it. He said that it had about 80,000 miles on it when he bought it used, but it ran great and he knew Guzzis, so he bought it. The only problem he mentioned was that he had to have a worn out tire changed recently. 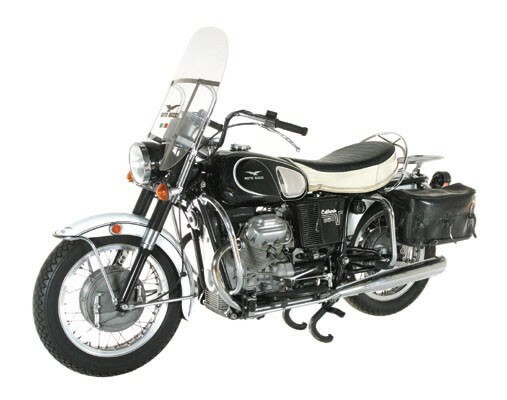 Finally, my local Guzzi dealer tells me about a Guzzi that comes in for service with over 300,000 miles it. That’s amazing – at least to me it is. I’m positive that there are loads of similar stories out there. How many miles or kilometers can a Cali take? Probably a lot more than any rider is willing to try. An interesting article about high mileage Guzzis is on the GuzziTech site, and has some good stories with it. As for me, I’m just starting my personal Guzzi California mileage adventure. I have absolutely no plans to replace my California Vintage, and no extra money laying around to add to the stable. I’m in it for the long haul on this machine and hope to share my own “how I did it” story about the high miles on mine. In the meantime, let’s hear about your stories by commenting below. Moto Guzzi introduced a special, single-year edition of the California to celebrate Moto Guzzi’s 75th anniversary in business which began in 1921. Nothing special yet but enjoying it…23,000 in 15 months…still rolling…fixing to run to corbin for a new seat! Ti sto scrivendo dall’Italia, da Roma per la precisione, dove per puro caso mi sono imbattuto nel tuo sito web di cui voglio esprimere i miei più sentiti complimenti. Ovviamente anch’io sono un felice possessore di un “Cali” Stone Touring di cui ne sono fiero! Grazie per il sito, continua così! I have been on Guzzi’s since 1972. I have my first one, a 73 Eldo, which has 270,000 on the clock. I have a 1973 Eldo with 3000 original, verifiable miles on it and a 2008 Calif Vintage. The Vintage is my fast travel, long distance machine. Purchased it two years ago from Winchester Moto Guzzi, in Virginia. It now has 13,000 original miles on it. Although it has had fuel pump issues as most newer Guzz’s they have been resolved. They are sensitive to gas quality and if possible I use non ethano. Wheras the Eldo will run on most anything if tuned or detuned. They are tuff tractor type motors. I have gone 300 miles with a cracked exhaut valve and once i arrived at the dealer I purchased a used EX Valve , spent an hour changing it and pressed on to Daytona. Then after which i rode it back to NM and another 50,000 miles before overhaul at 125,000. The Electrics on the ole Eldo is right off the VW shelf as far as Gen,Reg, V-Reg and starter relays. All available at any AZ, Disc. auto merchant or bug junk yard. presently I am working another build up of a Eldo basket case. My 40 year old daughter has a Guzzi Stone, and my 32 year old son has a 73 Eldo which I built for him when he was in High School as an incentive to get a college scholarship. He did that and still has the Eldo with about 23,ooo on it. I still ride the 72 Eldo on short 300 mile trips and enjoy it as its still a comfortable bike at 55MPH and it will still get up and pass at 60mph with a little effort. The brakes are the greatest deficiency. Otherwise Guzzi’s till the end…..